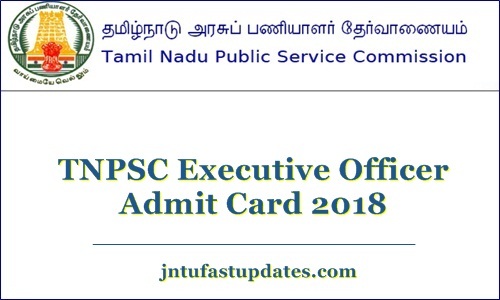 TNPSC Executive Officer Grade 3 & 4 Hall Ticket 2018 Download: Tamil Nadu Public Service Commission (TNPSC) is going to organize the executive officer written the test for Grade III and Grade IV posts shortly. The competitors who have applied for Tamil Nadu Executive Officer posts must download admit cards to attend this test. The TNPSC Executive Officer written test will be held in many examination centers across Tamil Nadu. The test is going to be held in the online format. Candidates applied for the TNPSC Grade III and Grade IV posts must practice well to clear the test as the competition is severed this year. Candidates applied for TNPSC Executive Officer posts will have to attend the test as per the scheduled dates. Before going to attend the examination, applicants are instructed to download the admit card/hall ticket to attend the examination. After downloading the hall ticket, aspirants can check the details of the examination date, exam center details, timings of the examination and other details from it. Tamil Nadu Public Service Commission (TNPSC) has recently issued a recruitment notification for 120 Executive Officer Grade III & IV Posts. Many of the aspirants seeking to get Tamil Nadu state government jobs have applied for the executive officer posts. The organization received a large number of applications from the interested and eligible aspirants this year. To select the suitable aspirants into executive officer posts, the TNPSC will organize the written test and interview rounds. Whoever qualifies these rounds with good merit will be considered to appoint in the announced posts. Hence the competitors must get the good merit in selection rounds to get the Tamil Nadu state government jobs. Aspirants applied for the TNPSC Grade III, IV posts will have the written test on 16th February and 17th February 2019 respectively. The Grade III examination will be held on 16th Feb and the Grade IV will be conducted on 17th Feb, as per the notification. Both the examinations will be held in the afternoon session from 2.30 to 5.30 pm. The TNPSC will conduct the examinations in online mode. Applicants must carry the admit cards while going to the examination. Hall ticket/admit card is the essential document; the examination officers will allow the candidates to the examination only after verifying their admit cards. Hence do not forget to carry the hall tickets to the examination. TNPSC is going to release the Executive Officer admit card before 10 days of the examination (approximately). The applicants can expect the admit cards in 1st week of February (tentatively). Verify all the details clearly from it. Take the printout of the admit card for further usage. The admit card must be shown to the invigilator at the time of verification. Otherwise, candidates will be rejected to continue with the examination. How To Download TNPSC Executive Officer Hall Ticket 2018 Online?